Reputations can be misleading. The city of Sardis was essentially dead, and it seems that the church was as well. This shell of a church evidently is asleep and has no strength. They are almost dead, and vital signs are faint at best. Jesus calls this church to remember and repent with the sober warning that failure to do so would result in being opposed by Jesus himself. It seems there was a remnant remaining faithful. The faithful will remain until the end, and they will be confessed by Jesus before the Father. Pergamum and Thyatira are sick while Sardis is near death. Is there any church to be commended in the group? It would seem so because the letter to Philadelphia contains no words of censure. They are commended keeping God's word, not denying Christ, and patiently endured persecution. Jesus loves them, and others will recognize that as well. He urges them to continue to hold fast. The church of Philadelphia had been faithful to the Lord in the face of real opposition. The ‘synagogue of Satan’ seems to refer to the Jews who opposed Christianity. These Christians would be rewarded by the Lord for their faithfulness by making their enemies recognize that the church truly is the fulfillment of God’s promises from the Old Testament. They will enjoy the presence and the name of the Lord forever. Laodicea was known for its prosperity, a city with banking, manufacturing, and a medical school. The prosperity of Laodicea led to pride and arrogance. Prosperity can be as great a threat to God’s people as adversity in spite of the fact that it is usually overlooked as an imminent threat. This church received the most severe rebuke of Christ’s letters. He issues a scathing indictment of the church’s disgusting and sickening lukewarmness. These Laodiceans did not see their spiritual condition and had no sense of their need. They thought that they were just fine when in fact they were wretched, pitiable, poor, blind, and naked. Pride can lead to a false sense of security. Jesus offered them everything that they could ever need but require repentance. He explains that his love is accompanied by reproof and discipline. He is able, willing, and ready. They need only repent and believe. Jesus introduces each letter by demonstrating his right and authority to direct and correct these churches. He is the one who has the seven spirits of God and the seven stars. He is the holy one, the true one, and has the key of David. Jesus is the Amen, the faithful witness, the true witness, and the beginning of God's creation. His call to these churches has application for us today. May we wake up, be strengthened, remember, endure, obey, and repent. If you have an ear, listen to what the Spirit says. How does a reputation get separated from the truth? How can one be strengthened in the Lord? How do you deny the word of God? How does someone hold fast to the faith? Why is being lukewarm such a problem? Why is prosperity so dangerous? How can you guard against being blind to the truth? Why do we reject discipline as love? 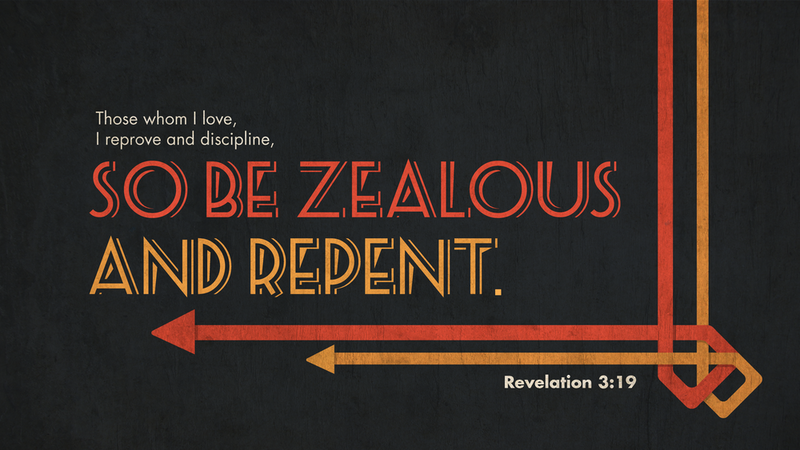 How can one be zealous to repent? As you pray today, praise Jesus for all the things he has declared himself to be in these letters.